Jeep’s venerable Wrangler enters it fourth generation. Think “Jeep” and invariably a picture of the Wrangler comes to mind. And as it should: the Jeep Wrangler is the spiritual successor to the original GP or Government Purposes vehicle that came to fame during the Second World War. The Wrangler name is, of course, much more recent than that — 1986 to be exact. That’s when American Motors replaced the CJ, itself directly derived from the Civilian Jeep produced by Willys-Overland. Worry that Jeep might do to the new Wrangler what it did to the Cherokee upon its 2014 return were always unfounded. Yes, the Cherokee offers a modern, if not polarizing take on the Jeep theme, but even that had its limits. Witness the 2018 Cherokee refresh. The 2018 Wrangler pays tribute to the original Jeep with its round headlights and square tail lamps as well as the keystone-shaped grille and the expected seven-slat vertical design. Subtle changes yield improved aerodynamics, while the fold-down windshield returns. You’ll also find various open-air options as well as door, top and windshield combinations. In other words, the new Wrangler stays true to its iconic roots. 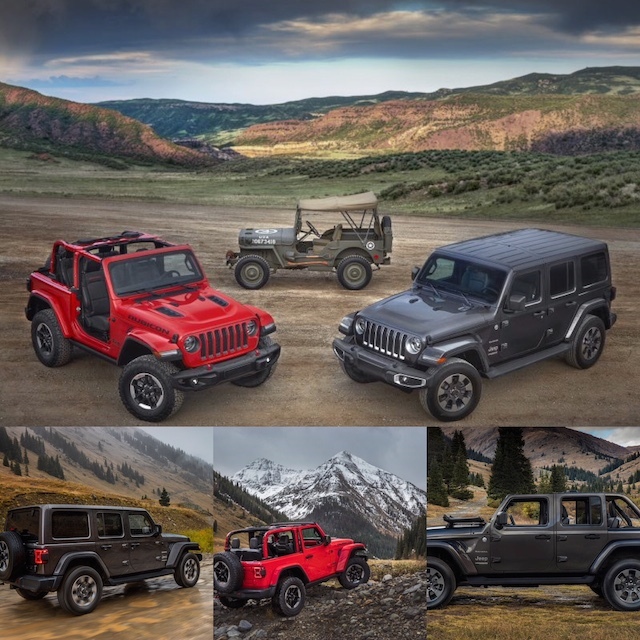 As before, Jeep offers both two- and four-door body styles with the 2018 model. The same naming differentiation continues: the standard model is the Wrangler and it comes in Sport, Sport S and Rubicon trims. The four-door Wrangler Unlimited comes in Sport, Sport S, Sahara and Rubicon trims. This doublet started in 2006 and has continued since. These days, Jeep sells more of the four-door than the two-door model as families embrace the Wrangler Unlimited. Beginning in 2012, Jeep replaced the previous 3.8-liter V6 with a modern 3.6-liter “Pentastar” V6, an improvement that’s yielded a strong improvement for the Wrangler. From 2012 to 2017, Jeep had six-speed manual and five-speed automatic transmissions working alongside this venerable V6. Well, the V6 is back and it now works alongside a six-speed manual or an eight-speed automatic transmission. Moreover, the engine now includes stop-start technology for improved efficiency. The Pentastar V6 now delivers 285 horsepower and 260 pound-feet of torque. 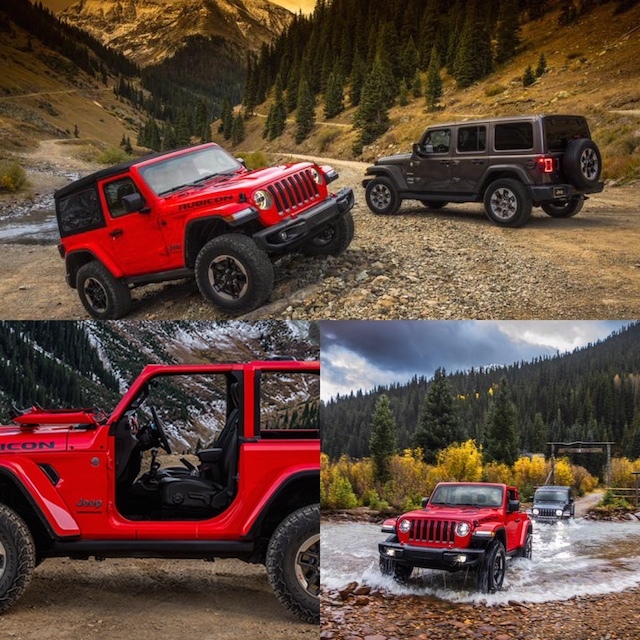 Two additional engines join the Wrangler line this year. The first is a 2.0-liter turbocharged inline four-cylinder engine with an output of 270 horsepower and 295 pound-feet of torque. It is part of a mild hybrid system where a small electric motor controls automatic start/stop, electric power assist, battery charging, regenerative braking and other ancillary components. The second new engine and third overall is a 3.0-liter turbo-diesel V6. Yes, the same one offered in the Ram 1500. It doesn’t arrive until 2019 and reserved exclusively for the four-door Wrangler Unlimited only. This engine makes 260 horsepower and 442 pound-feet of torque. It also employs stop-start technology and like the turbo inline-four, it comes exclusively paired with an eight-speed automatic transmission. What’s a Jeep if you don’t take it off-roading? While many other Jeep products have off-road credentials, the Wrangler sets the pace. It does so with Command-Trac and Rock-Trac four-wheel drive systems, a new Selec-Trac full-time two-speed transfer case, Tru-Lock electric front- and rear-axle lockers, a Trac-Lok limited slip differential and 33-inch off-road tires — the better for optimizing climbing, descending and mudding. Oh, yeah, this model tows too — up to 3,500 pounds. Versatility, anyone? Jeep has always been about customization, something owners are wont to do. The aftermarket is especially strong for the Wrangler. At the same time, Jeep offers no less than 11 packages and equipment groups, depending on the trim. For instance, the Black Three-piece Hardtop Group — includes the black three-piece hardtop, rear window defroster, and a rear window washer and wiper. It’s worth a mention because just like the Trailer Tow and Heavy Duty Electric Group Package, it is available on every Wrangler and Wrangler Unlimited trim. Available on all but the base models is a Jeep Active Safety Group. This package includes rear park assist, blind-spot monitoring, and LED tail lamps. Yes, the Wrangler now includes safety equipment. Importantly, a rearview camera with dynamic gridlines joins the Wrangler line as standard equipment. Other packages improve infotainment, technology and LED lighting. Jeep prices the 2018 Wrangler from $28,190, inclusive of a $1,195 destination charge. As for the Wrangler Unlimited, it begins at just $800 more — $28,990. Top-of-the-line models for both body styles surpass $40,000. Indeed, while playing with the Pricing Configurator, we came up with a high-end price of $53,290 for the four-door with every package, individual upgrade and miscellaneous items taken. Photos courtesy of Fiat Chrysler Automobiles. All rights reserved.